In the mid-1800’s the Washington settlement expanded into the Bellingham Bay area with the addition of four new communities: Whatcom in 1852, Fairhaven and Bellingham in 1853, and Sehome in 1854. In August of 1883, Bishop John Adams Paddock dispatched the Rev. Reuben Denton Nevius D.D. to Bellingham Bay to survey the area and see if it was ready for an Episcopal church. Bishop Paddock’s intent was to establish a church in each of these four communities. Reverend Nevius had performed this task many times before in the Oregon and Washington territories and was referred to as “a veritable Johnny Appleseed of Episcopal churches in the Northwest”. Reverend Nevius held his first service in the Reveille Hall which prompted a few local women to invite him to return in September to discuss ways to organize the establishment of an Episcopal church. They met in the home of Mrs. Cora Gardner and the Women’s Guild of the Church of the Messiah was formed. The initial Guild consisted of six members: Cora Gardner, Laura Weisenburger, Susanna Steinweg, Harriet Stubbs, F. Mae Manly and Jennie Powell with Mss. Gardner, Powell and Steinweg serving as its first officers. The Guild members worked tirelessly to procure funds to purchase property and material to construct a church by organizing concerts, festivals and “entertainments” (plays) such as, “The Peak Sisters” and “Mrs. Jarley’s Wax Works”. They supplied sewing and “fancy work” items for sale at fairs and in 1885, the first church building was constructed at a cost of $1,300 on land donated by a local mill owner, Captain Henry Roeder. The first service in the new church was held on May 10, 1885, and The Reverend John Hoffman Birkhead served as the first Vicar of Whatcom St. Paul’s. His initial compensation consisted of the loose collection, but later the Guild provided him with a salary of $5.00 a month. The first wedding took place on September 16, 1885, between Lottie Tuttle Roeder and Charles Independence Roth. In 1889, St. Barnabas was established in the community of Sehome, and in 1890, St. James in the community of Fairhaven. In 1890, the communities of Bellingham and Fairhaven merged and became Fairhaven; and in 1891, Whatcom and Sehome merged to become New Whatcom. With this later merger, St. Barnabas was discontinued in 1892 and Whatcom St. Paul’s became New Whatcom St. Paul’s. St. Luke’s Hospital was founded by Diocese convention in 1892 and placed under the leadership of St. James, Fairhaven who operated it until 1904 when the Diocese conveyed it to St. Paul’s with the closure of St. James. The St. Paul’s parish operated the hospital for 34 years then deeded it to the community in 1938. It was subsequently purchased by St. Joseph’s Hospital in 1989. The original parish hall still stands and is in constant use to this day. In 1923, talks began in earnest on the subject of building a new church. In 1924, Robert and Mary Welsh proposed that the edifice be a memorial to the late Right Reverend Frederic W. Keator, “beloved Bishop of the Diocese”. A building committee under the leadership of the Rector, Canon E. B. Smith, and members Dr. E. W. Stimpson and Mr. Charles Nolte was appointed by the Vestry. The architectural firm of F. Stanley Piper was hired and a Gothic cruciform design seating approximately 500 was created. Several building sites were considered for the new church and the committee finally recommended the "Ireland property" at the corner of Eldridge and Walnut. Most agreed a better site could not have been chosen. It commanded a view of the entire length of Holly, the main business street at that time. It overlooked the Bay and the spire could be seen from almost every part of the city. Holly, Eldridge, Broadway and Walnut all seemed to point to the church, and it was on the main Pacific Highway welcoming visitors to the city. The best reason, however, seemed to be that it did not represent a new site, but rather an extension of the old one and a continuity with the heritage of the past. A contract was awarded to the construction firm of Chisom, Selene and Standen and a groundbreaking ceremony took place on July 15, 1925, with The Rt. Reverend S. Arthur Huston in attendance. Construction began the following day and just 10 weeks later, on September 27, 1925, another ceremony was held to commemorate the laying of the cornerstone by Bishop Huston. At the ceremony, Bishop Huston spoke these words: "I lay the cornerstone of a building to be named St. Paul's Church and to be devoted to the services of Almighty God in accordance with the doctrine, discipline and worship of the Protestant Episcopal Church in the United States of America, that here true faith with the fear of God and brotherly love may forever flourish and abound: and that this place may be a House of Prayer for all time to come. Other foundation can no man lay than that is laid, which is Jesus Christ." 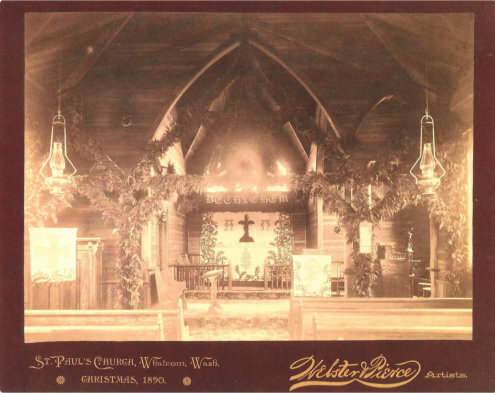 Prior to completion several first-time events took place in the new church: the wedding of Leila Juliet Borchers and Clarence Henry Irwin, the Associate Architect for the construction, on June 26, 1926; the baptism of Mr. & Mrs. F. Stanley Piper’s son, Lawrence Wells Piper; and the Confirmation of fifty-six candidates. Construction of the new St. Paul’s was completed in 1927 at a cost of approximately $45,000 and dedicated on September 27, 1927, by The Rt. Rev. S. Arthur Huston. The exterior of the church utilizes a light-colored tapestry brick; the windows and doors are ornamented with terra cotta; and the roofing is Vermont slate. The interior walls are tinted plaster with a wood dado encircling the entire nave and chancel from the fir flooring to the bottom of the windows and adorned with sand-blasted designs. The furnishings and sixteen stained glass windows depicting the short life of Jesus Christ were generous gifts from various church guilds and individual parishioners. Since 1927, two additions have been made to the church. The first was in 1950 when a Religious Education Building was added on the north side and named Stimpson Hall in honor of the many years of service given by this church family. The hall housed offices for clergy, secretary and choir director, contained a library/reception room, and the Sunday School. The final addition was the Haggen-Clark Hall which was dedicated on January 21, 1996. This addition was made possible in large part by the generous donations from the Haggen and Clark families along with significant contributions from other church parishioners. It includes the Great Hall with a commercial kitchen, a sports hall, and class/meeting rooms on three levels. These spaces are used by various community organizations as well as by the congregation for the many church activities. Over the years St. Paul’s has been a valuable member of the Bellingham community through its many ministries and its parishioners continue to reflect the Christian spirit of its founders. Today, St. Paul’s is one of the 107 parishes in the Diocese of Olympia, which is in Province VIII and one of the 110 dioceses in the Episcopal Church of the United States. In the summer of 2015, Peter and Norma Sherwood traveled to Bellingham, England to present a flag that was blessed by St. Paul's to our sister church, St. Cuthbert's, in Northumberland. Click here to read a fascinating history of the flag and some historical ties between our two cities. Our thanks to Peter and Norma for initiating this idea and doing the research. We are flying your flag on the 4th of July and on the Conversion of St Paul on 25th January. I thought you might like to see the photos, even though they haven't come out brilliantly. We will try again in January. We have also displayed the two framed articles and photos of your church in the south transept of ours. It was a great pleasure to meet you and your wife. Please pass on our gratitude and our friendship to your congregation. Churchwarden, St Cuthbert's Bellingham, Northumberland.